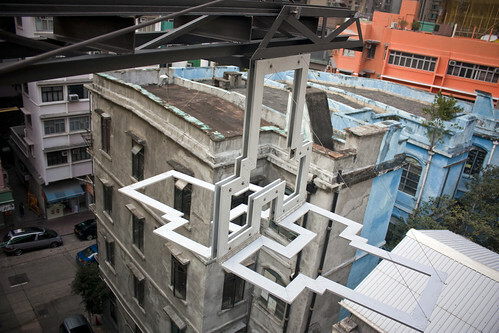 You can see a lot of unauthorized structures on the rooftops of Wan Chai— sheet metal canopies, rusted chain-link fences, hand-built wooden shacks — but none of them quite looks like KAPKAR, a new sculpture by Dutch artist Frank Havermans, which was installed last week on the roof of the Wan Chai Visual Archive. Havermans’ description of KAPKAR as a “creature” is apt; it looks like a suspension bridge on the prowl. Made of iron by the Sunny and Sons metal shop, just around the corner from the Archive, it has four legs and a spine held up by steel cables. Its snout is a retractable aluminum, glow-in-the-dark signboard — shaped exactly like the Archive’s floorplan — that hangs precariously over the street. KAPKAR as it was being installed by crane. The Archive is a six-storey tong lau tenement building just around the corner from Wan Chai’s famous Blue House. It’s a kind of experiment in urban redevelopment: eventually, it will be torn down and replaced with a highrise hotel, but for now, it has been converted into a creative cluster, with a quirky bar on the ground floor, exhibition space above and luxury serviced apartments on the top four floors. Havermans recently spent three months in Shenzhen, where he produced a series of five scrap-wood sculptures based on the old farming and fishing villages that can be found throughout the city. After the creation of the Special Economic Zone in 1979, villagers tore down their houses and build tenements for migrant workers. Like a coral reef growing on the remains of a sunken ship, they are densely-packed, haphazardly organized and teeming with life in a city that is otherwise vast and rational. These urban layers usually exist in the shadows of the law. 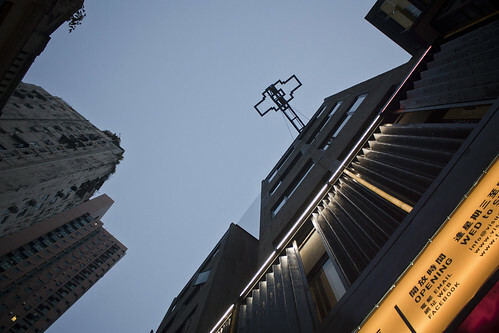 Hong Kong’s famous signboards are largely unregulated; many hawker stalls have been illegally modified beyond what the government allows; and rooftop houses and squatter’s huts are completely illegal, but tolerated by officials because they provide affordable housing in a city where property prices are soaring. 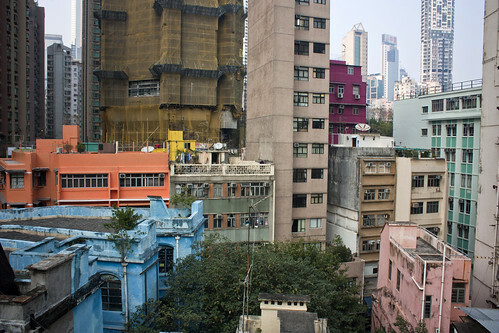 This entry was written by Christopher DeWolf , posted on Thursday February 23 2012at 06:02 am , filed under Architecture, Art and Design, Asia Pacific and tagged Art Installation, Hong Kong, Informal Settlements, Rooftops, Sculpture, Squatters . Bookmark the permalink . Post a comment below or leave a trackback: Trackback URL.